Hard Tooling – Seamless Rule – AmeriKen Online! Now a multi-joined steel rule die can be re-created as a foolproof seamless punch! AmeriKen accomplishes this revolutionary punch with precision manufacturing techniques and state-of-the-art equipment. This breakthrough generates a die that incorporates every feature of a traditional die, including all creasing, perforationm, scoring rule and serrated knives. Eliminates joints, integrates any point size of rule, mix and match bevel angles on a single edge, balances pressure acros the entire punch. The diemaker can cut thicker, tougher materials with minimal tool deflection, and gets the strength and wear characteristics only high quality tool steel an bring. 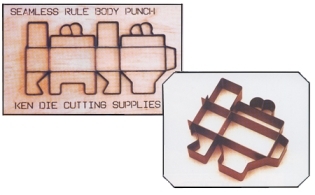 Seamless punches assure perfect repeatability and reduce set up time from diecut part to diecut part.